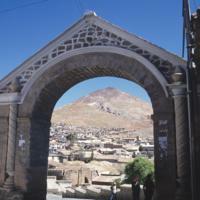 This pointed arch flanked by columns forms a portal, dividing central Potosí from sprawling neighborhoods and the Cerro Rico. In the colonial period, the Arco de Cobjia marked the entrance of a main road from the port of Cobija on the Pacific coast into the city’s center. Roads leading out of Potosí connected the city, and the silver that flowed from its mines, to the international economy. 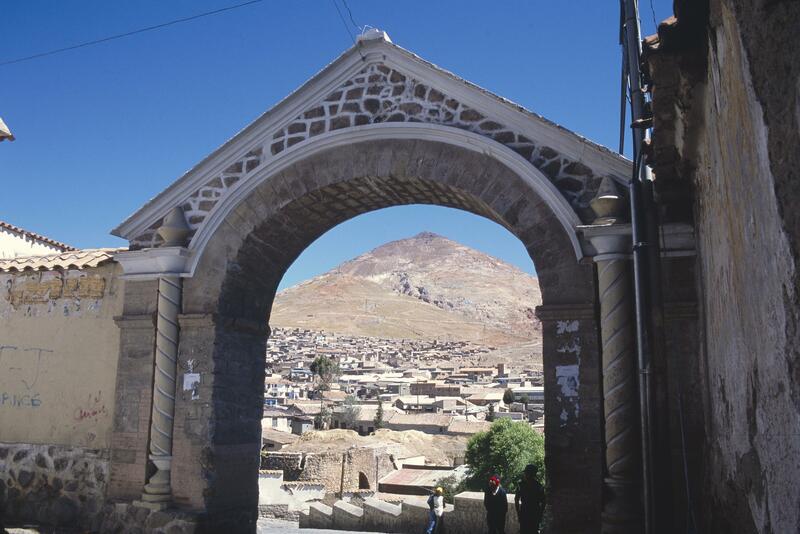 This arch marked one of the most important routes: it led to the Pacific coast, where in the 16th and 17th centuries, silver would be loaded onto the Spanish “treasure fleet.” The arch frames the Cerro Rico, whose mines made Potosí one of the wealthiest cities in Spanish America. Today the urban sprawl of Potosí extends out towards the base of Cerro Rico. In the colonial period, these neighborhoods were largely occupied by native Andeans from different regions around Potosí who first came to the city to work the mines as part of the mit’a system. The Arco de Cobjia probably dates to the 17th century. It is built of stone, but has been reworked and restored over the centuries. Monuments like the Arco de Cobija served as symbolic and functional landmarks for residents of Potosí by defining the urban fabric, ethnicity and history of the city. In the 17th century, for instance, a number of religious writers complained that the silver mined in Potosí came only at the expense of too many indigenous lives. Indigenous miners did work under harsh and unforgiving conditions—often under compulsion rather than by choice. Yet not all native Andean miners left Potosí as soon as they could. Many decided to stay, and settled in neighborhoods with other Andeans. These neighborhoods would have existed outside the center of the city, a region defined in part by the Arco de Cobija. Kagan, Richard. 1998. Imágenes urbanas del mundo hispánico, 1493-1780. Madrid: Viso. Kagan, Richard. 2000. Urban Images of the Hispanic World, 1493-1793. New Haven, Connecticut and London: Yale University Press. Villa Rodríguez, José, ed. 2000. Potosí: plata para Europa. Seville: Universidad de Sevilla/Fundacíon El Monte.